How do you spell “Quirky”? Q-U-I-R-K-Y. Quirky. Anthony Scimonelli directed the Arts Collective production, which alternately induces laughter and pathos, with a sure-fire guiding hand. He is blessed with a young talented cast and an excellent creative team that make this production a delight while staying true to the quirkiness of the plot. The story of six idiosyncratic middle schoolers as they navigate through life’s challenges and puberty while fiercely competing in a spelling bee in Putnam County for a shot at a national title is the show’s foundation. Four audience members who had signed up in advance participate onstage, which adds more joy and an air of unpredictability to the action. The back stories of each of the teens are presented as they compete hard for victory and through song and dance. They all perform quite nicely both as solo performances or in group numbers, and with the nifty choreography by Jess Beach, they dance well. 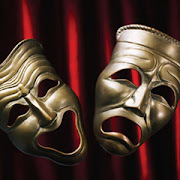 Some in the cast are called on to play multiple roles that showcase their talents. The first thing the audience will notice upon entering the Studio Theatre is Mollie Singer’s clever set depicting a high school gymnasium complete with a basketball hoop above and a foul lane on the floor where the spelling bee takes place. Add banners on the wall representing Putnam High School championships in not-so-major sporting endeavors, a two-tier row of chairs for the contestants and a table for the bee’s moderators and you have one terrific functional set in which the performers have sufficient room to execute their dance numbers. Before we get to the pre-pubescent characters, one must look at the two adults on the stage. Lauren Blake Williams who primarily plays Rona Lisa Paretti, a top local real estate agent and former spelling bee champion. She seems to be the most together of all the characters and becomes the anchor of the show. Ms. Williams plays the role with ease and comfort and possesses a lovely singing voice to boot. She performs very well in a series of “Rona’s Favorite Moment” numbers. Though Mayumi Baker Griffie’s four-piece orchestra is excellent, its close proximity to the action and the physical construct of the theater causes the sound to overwhelm Ms. Williams’ vocals at times as well as those of other performers. A solution would be to mic the performers to create more balance. Daniel Johnston as Vice Principal Douglas Panch effectively provides much of the comedic lines throughout. He is the other spelling bee’s moderator whose sarcasm and zingers as well as his examples of sentences on how the contested words are used are often hilarious. Mr. Johnston plays two other characters including Jesus, no less, and does so with mischief. The third character, the gay father of one of the contestants, is portrayed with high camp and relish but a bit too stereotypically. He and his partner’s (Diego Esmolo) daughter, Logainne “Schwarzy” SchwartzandGrubenierre (their sir names combined) is the youngest of the contestants. Played by Kaity Krull, she is subject to her dads’ pressure to win the bee. Her performance of “Woe is Me,” which is reprised upon her elimination from the competition ably reflects the stress placed on her by her overbearing dads. Another contestant is Olive Ostrovsky played by Gabrielle Amaro. Her mother is away and her father is always working late and she is not receiving the love she needs. While spelling one of the words in the bee, she envisions her parents being there to support her in what is the show’s most powerful and dramatic ballad, “The I Love You Song.” Excellent vocals from Ms. Amaro bring heft to the song aided superbly by Ms. Williams and Mr. Watts who portray her parents. Warren C. Harris ably plays another comical character William Morris Barfée (note the accent mark). The constant mispronunciation of his last name by moderator Douglas Panch becomes a running joke. One of the more interesting characters is Marcy Park played superbly by Jordan Colea. A true overachiever (she speaks six languages and excels in sports and classical music), she is not allowed to cry, gets three hours of sleep and attends the Catholic school, Our Lady of Intermittent Sorrows. Cocky from winning all the time, Marcy finally falls in the competition. Her rendition of “I Speak Six Languages” is excellent. The 25th Annual Putnam County Spelling Bee is a joy to experience. Andrew Haag’s spot-on lighting design and the costumes by Robert Croghan cap off an expertly directed production performed by a wonderful cast and should not be missed. Advisory: There is adult material and the show is not recommended for children under 12. 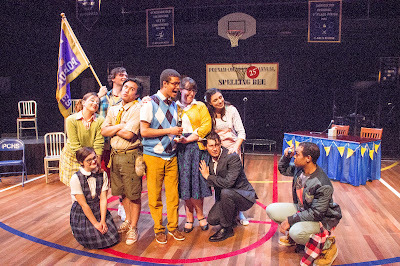 The 25th Annual Putnam County Spelling Bee runs weekends through June 5 at the Studio Theatre – Howard Community College, Horowitz Center, 10901 Little Patuxent Parkway, Columbia, MD 21044. Tickets may be purchased by calling the Box Office at 443-518-1500 or visiting online. No matter our age, we can all enjoy a good fairy tale with a happy ending to brighten our lives. 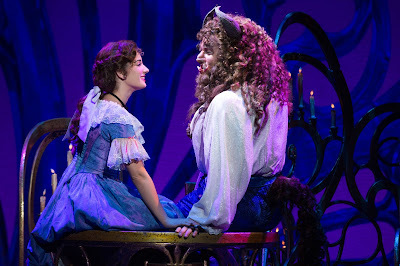 Pleasantly, the touring production of Beauty and the Beast produced by NETworks Presentations that is making a brief stop at the Hippodrome Theatre fits that bill. In its ninth month on tour, the production, for the most part, gets it right. Beauty and the Beast delivers a majestic spectacle of superb music (directed by Kevin Francis Finn) that is performed by strong vocals and dazzling, high tempo dancing choreographed by Matt West. Mr. Taylor’s scenery is exquisite in its creativity and design. With many pieces in use like the houses in the Bavarian-like town, scenes change seamlessly throughout. This excellence in the staging is a hallmark of the show. The one flaw is that the orchestration was over-amplified on opening night and at times drowned out the vocals and dialogue. This was most noticeable at the outset when the Prologue overwhelmed the narrator who set the premise for the tale. Hopefully, this blip will be resolved as the run continues. Aside from that quibble, the production excels on many fronts. The musical, which was based on the animated feature film with the same name and became the ninth longest ever running musical on Broadway, features the Oscar-winning score with music by Alan Menken and lyrics by Howard Ashman, with additional songs composed by Alan Menken and lyrics by Tim Rice. The book is written by Linda Woolverton. 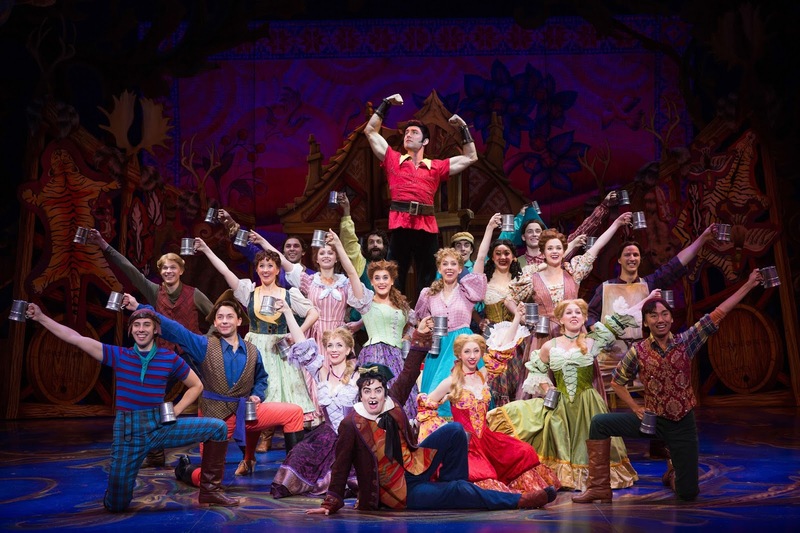 Show-stopping production numbers, such as “Be Our Guest” and “Gaston” showcasing the singing and dancing talents of the ensemble are audience pleasers to be sure. Yet, it is the fairy tale itself that sweeps you away on an emotional and romantic journey. The story of a spoiled prince who had been transformed by an enchantress into a boorish, hot-tempered beast until he can find love and return to his human form before petals fall off from an eternal rose given by the enchantress and a beautiful woman Belle from a provincial town is tender and endearing. This relationship has the audience rooting hard for both. Also pushing hard for the couple to fall in love are various servants in the prince’s castle who were converted into household objects when the spell was cast on the prince. They, too, have a stake in the spell being removed. Simultaneously, the town’s egomaniacal, bicep-flexing, bully, Gaston, rejected by Belle to be his wife, strives to make her change her mind. Christiaan Smith-Kotlarek romps through his role as the superior, perfect-looking God’s gift to the world, Gaston. His character, though an antagonist, provides most of the comic relief throughout because of his over-the-top self-centeredness with the amusing help from Matt Dasilva as Lefou, Gaston’s goofy, ever-fawning sidekick. Mr. Smith-Kotlarek’s commanding baritone in “Me,” “Gaston” and “The Mob Song” is on display. As mentioned earlier, the Beast’s staff had been turned into such objects as a teapot (Mrs. Potts played by Stephanie Gray). Her rendition of the title song was performed sweetly. Other characters in this group include Cogsworth, the clock (Samuel Shurtleff); Babette, the feather duster (Melissa Jones); Lumiere, the candelabra (Ryan N. Phillips; Madame de la Grande Bouche, the wardrobe (Stephanie Harter Gilmore); and Chip, the cup (Jake Jones in this performance). All did well in their mostly comic roles as foils to the Beast. Also, turning in a solid performance is Thomas Mothershed as Maurice, Belle’s inventor-father. The Hippodrome mounting of Beauty and the Best proves why the musical has received such worldwide popularity. It has everything one needs to be entertained including a feel-good story line that will warm your heart. Bring the kids, too; they’ll love it. But hurry. Running time. Two hours and 10 minutes with an intermission. Beauty and the Beast runs through May 15 at the Hippodrome Theatre at the France-Merrick Performing Arts Center, 12 N. Eutaw St, Baltimore, MD 21201. For tickets, call Ticketmaster at 800-982-ARTS or visit Ticketmaster or the Hippodrome. We’re all but officially starting the general election fracas now that Donald Trump has averted a brokered convention and Hillary Clinton is on the verge of sewing up her nomination for president. Overwhelmingly, pundits give Trump zero to less than zero chance to win the election in November. Electoral maps based on statewide polling show that Clinton should win the states Obama did in 2012 and perhaps even expand on it. Some maps indicate that she starts off already exceeding the 270 electoral votes to nail down the victory. Nonetheless, this has been an odd election cycle, to say the least, and accordingly, I don’t think Hillary is a lock despite the conventional wisdom. She has major advantages given her experience and the widespread view that Trump lacks the knowledge of government. Both she and Trump, however, have high unfavorability percentages, which muddy the waters. The mogul has the steepest of climbs to pull off the greatest upset ever, but it is possible and all the stars must be aligned for this to occur. 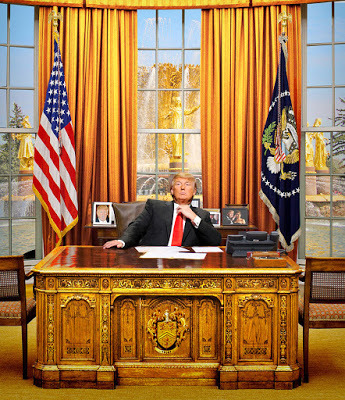 Below are several situations that should they materialize could give Trump the victory. I rate its probability by using stars: one star meaning it is metaphysically impossible for it to occur to five stars making it a certainty. As you can see, those stars are not likely to be aligned—Trump needed 5 stars in each—to forge an upset. In this crazy political season, however, nothing can be taken for granted.